Today s youth is confronted not only with the developmental tasks of adolescence, but also with substantial social and economic changes on the macro level originating from globalization and economic volatility. 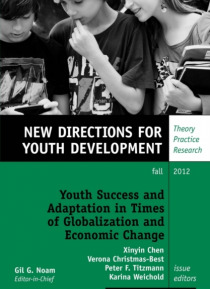 Presenting research on the implications of social and economic changes for today s youth, this volume covers important topics: Adolescents future perspectives The competencies they need t… o prosper in specific cultures Changes related to family and school Gender differences in economic roles within changing societies The effects of technological progress on their lives The way in which they cope with biographical transitions in flexible markets Issues of health and resilience. The articles provide valuable suggestions about what is being done and can be done with regard to individuals or particular groups of youth, especially concerning the application of research findings to interventions. This is the 135th volume of New Directions for Youth Development, the Jossey-Bass quarterly report series dedicated to bringing together everyone concerned with helping young people, including scholars, practitioners, and people from different disciplines and professions.